We’d love your help. Let us know what’s wrong with this preview of Between the Lies by Michelle Adams. Chloe Daniels regains consciousness in a hospital with no memory The truth is hiding between the lies. To ask other readers questions about Between the Lies, please sign up. Chloe Daniels wakes up from a coma and has no memory of how she got there. There are people visiting her who say they are her family, she has no memory of them, she doesn't recognize her name, if she had a career, where she lived, etc. As Chloe slowly starts to recover, her family begins to give her little spinets of information about her life, where she lived and that she was involved in a car crash. But even with no memory, Chloe knows that something isn't right. Something doesn't feel right. C Chloe Daniels wakes up from a coma and has no memory of how she got there. There are people visiting her who say they are her family, she has no memory of them, she doesn't recognize her name, if she had a career, where she lived, etc. As Chloe slowly starts to recover, her family begins to give her little spinets of information about her life, where she lived and that she was involved in a car crash. But even with no memory, Chloe knows that something isn't right. Something doesn't feel right. Can she trust what they are telling her? Could they be lying to her? She is having dreams and wonders if what she is dreaming could be real. As she continues to make improvements, she becomes determined to know the truth- no matter what. So, I think we have read a few books with characters who wake up in a hospital with no memory. Here is another and yet, it is captivating. It became a real page turner for me as I wanted to learn the truth! Early on it becomes evident that things are not right. Heck, the word “lies” is the title. So, I knew someone had to being telling a tale or two…but who? Or maybe everyone is lying. Or maybe Chloe is lying? The fun was trying to determine what was true and what was a lie. Plus, if her family is lying, why? Who has something to hide? If they are hiding something, why? So many questions went through my mind. I had my theories. I am guessing that quite a few people will guess a twist or two. There is quite a bit going on in this book and I did guess some things but not everything. Even with the things I did guess, I still really enjoyed the book. This book had layers. With each reveal, the reader learns more about Chloe, her past and the events leading up to her being unconscious in the hospital. I could feel Chloe's fear, frustration, and doubt. Imagine being both physically and mentally impaired. Imagine being at the mercy of people you do not remember. People who you being to doubt and the things they are telling you do not sit right with you. Absorbing is a word I would use to describe this book. I was riveted to the pages and had my own doubts about some of the characters. Well done psychological thriller that did not disappoint. What a deliciously creepy premise! Chloe is in a car accident, the after effect of which is amnesia. She has no memory of her prior life. Her parents take her back to their home, but don’t tell her much at all about her life and refuse to let her visit her own home or even leave their grounds. What are they trying to hide from her? The book definitely grabbed me. My mind was coming up with all different reasons Chloe’s family seems determined to keep her from the truth. Which one, if any, was the correct one? Are they protecting her from herself or someone else? There were times I questioned why Chloe didn’t take some elementary steps to learn the truth. The book is told mostly from Chloe’s POV, other than some intermittent chapters from an unknown person. Once again, there are multiple possibilities of whom this unknown person could be. Nice short chapters and told in a mostly linear fashion. (Is anyone besides me getting tired of books that have frequent changes in time?) Lots of twists and turns. Some but not all were easy to figure out. The book starts much stronger than it finishes. The ending veers too much into the unbelievable category. As is always the case with amnesia plot lines, her memory comes back at a very convenient time. When Chloe Daniels wakes up in the hospital, she has no idea how she ended up there, or even who she is. Surrounded by people claiming to be her family, Chloe remains scared and unsure. She has no recollection of any of them. Soon they are whisking her home and setting her up in a room they say is hers but still, nothing seems familiar. The man who says he is her Father also happens to be a psychiatrist and begins holding sessions with Chloe to help regain her memories. As the story unfolds, Chloe When Chloe Daniels wakes up in the hospital, she has no idea how she ended up there, or even who she is. As the story unfolds, Chloe does begin to get flashbacks, both of the night of her accident and her before. Through recollections, and speaking with those around her, the story of her life 'before' begins to be pieced together. I found Between the Lies to be a fast-paced and compelling read. It is intense right from the very beginning. You know there has to be a 'baddie' in this story and I suspected everyone, including Chloe herself! When I wasn't reading this book, I was thinking about it and to me, that is a sign of a good one. I did eventually guess the baddie prior to the reveal but it was still a hecka' ton of fun. Additionally, there was a twist I wasn't expecting that left me on the final page with a sinister smile on my face. Can you guess who the liar is? Just the thought of waking up in a hospital and not knowing who you are or how you got there is such a terrifying scenario. Chloe is told that she was involved in a terrible car accident, but she has no memory of her past. When Chloe leaves the hospital she goes to live with a family that she doesn't remember, she doesn't know them. Her father is a doctor and is treating her amnesia, but is he telling her everything? Why would he lie to her? I didn't trust him either. Plenty of unreliable characters pop up in this book! Lots of guessing and some suspenseful moments made this one a twisted puzzle. I liked Chloe and wanted a happy ending for her. The pace of the first half of the book was the best, as I was able to figure a few things out over the second half and wanted a bit more from the reveal. Overall, it was entertaining and I think many will be much more surprised at some of the twists than I was because I read so many thrillers. EXCERPT: My father tells me that once we have finished the therapy sessions everything will be as it once was, nothing more than a faint, well-healed scar left behind to connect my past to my present. But no matter what he does, no matter how hard he tries, I'm not going to be able to slip back into my old life. The person I used to be is dead, taken away from us in the crash. And even though I'm confused about most things, there is one thing I do know: you can't bring the dead back to life. The EXCERPT: My father tells me that once we have finished the therapy sessions everything will be as it once was, nothing more than a faint, well-healed scar left behind to connect my past to my present. But no matter what he does, no matter how hard he tries, I'm not going to be able to slip back into my old life. The person I used to be is dead, taken away from us in the crash. And even though I'm confused about most things, there is one thing I do know: you can't bring the dead back to life. The old Chloe is gone, and I'm afraid I might never get her back. I'm more afraid that my family don't want me to. ABOUT THIS BOOK: What would you do if you woke up and didn't know who you were? MY THOUGHTS: I am at that age where I sometimes forget things. I swear I put something somewhere, and find it somewhere totally different. I leave the room to do something and, halfway to wherever I am going, forget what it was I was going to do. Frustrating and annoying as this may be, it palls in comparison to forgetting your whole life, at having to rely on what people, whom you don't remember, tell you is the truth. But then, why would they lie? I felt that I was being swept along by an avalanche as I read Between the Lies by Michelle Adams. I started it when I went to bed last night, and finished it before bed tonight. It has all the ingredients of a great read: secrets, lies, memory loss, manipulative people, death and deceit. Told mainly from Chloe's point of view, with occasional input from an unknown character, the pace is relentless, the plot full of surprises. Trying to unravel the identity of the unknown character had me accusing character after character of being 'the one'. Yes, I did get it right, eventually. . . This is a really good read, not a perfect read, but a really good one. Good enough to have me chasing up other books by this author. It is not always entirely plausible, there are a couple of smallish holes in the technicalities, but overall I really enjoyed Between the Lies. THE AUTHOR: I was born in 1981, the youngest of five and the only girl. For a short period of time after that I might have been my mum's long awaited princess, but it became obvious that I was the kind of child who was more into mud pies and catching insects than I was pretty dresses. I loved my purple Doc Marten's, hated my floral wallpaper, and was never allowed to paint my bedroom black. No, not even the ceiling. I went to school in Warwick, UK, and throughout my school years I loved art, music, and English, yet somehow managed to end up studying clinical science at university. Despite my graduation and subsequent employment as a physiologist in cardiology, my creative tendencies were never far away. And the one aspiration I could never let go of was that of being a writer, so on a wet new year's eve sometime around the turn of the millennium, I announced to a friend that I was going to write a book. It took another five years of note taking and day dreaming, but eventually I sat down to complete my first manuscript. It didn't get picked up, but it drove me into writing the second, and third, and so on and so forth. By early 2015 I had finished writing MY SISTER, and I was offered representation by the Madeleine Milburn Literary, TV, and Film Agency. MY SISTER became my debut, and it is hotly followed by BETWEEN THE LIES in July 2018. Now I write almost every day, starting at nine, finishing at some point in the afternoon. Sometimes people ask me where I get my idea's from, and it's a hard question to answer. Lot's of things inspire me, but if I had to sum it up in one word the answer would probably be people; the things we do, say, and the different ways in which we behave towards one another. When I’m not writing I love to read. The first book that I didn't want to end was Margaret Atwood's The Handmaid's Tale, and the first book that broke my heart was Captain Corelli's Mandolin. Gerald's Game by Stephen King was the spark that made me want to write in the first place. I think I was probably about nine when I read that. I like people who don't give up on their dreams, and those who show compassion for other people. I am crazy about my cat, and fortunate that the other people in my house tolerate him. I love travelling, and am lucky enough to live close to Greece which has to be one of the most beautiful places in the world. I'm currently training for the London marathon, so if you've got training tips, or ideas on how to avoid shin splints, I want to hear them. Finally, if you love Game of Thrones you can count me as a friend, but if you shared my theory regarding the Tower of Joy before you watched THAT episode, or have access to a pre-release copy of The Winds of Winter, you can count yourself part of the family. DISCLOSURE: Thank you to St Martin's Press via Netgalley for providing a digital ARC of Between the Lies by Michelle Adams for review. All opinions expressed in this review are entirely my own personal opinions. What a start, we are flung straight into action with what appears to be a car crash and someone trapped in the car. Chloe wakes up in hospital surrounded by family not knowing who she is or what happened to her. She has been in a coma for over a month!! Back at her parents Rectory with her sister Jess, she has a feeling that they do not want her to get her memory back. Can she trust these people who say they are family but whom she cannot remember. This is a great book with lots of twists along t What a start, we are flung straight into action with what appears to be a car crash and someone trapped in the car. Chloe wakes up in hospital surrounded by family not knowing who she is or what happened to her. She has been in a coma for over a month!! This is a great book with lots of twists along the way, it was like a spider web of lies, each lie woven tightly only to reveal another layer of lies underneath!! I could not tell who was actually telling the truth which added to the mystery. I thoroughly enjoyed this book and found myself fully immersed in the story. I was already hooked by the end of the first chapter and that's saying a lot because amnesia storylines aren't typically my favorite thing to read. My motivation to keep reading really boils down to there just seemed to be so many possibilities and directions this story could take which was intriguing. While I preferred the first half of the book over the second, overall this was one of those fun, popcorn eating reads. Chloe Daniels regains consciousness and finds herself in the hospital but has no memory of how she got there or anything about her life. Even though she doesn't recognize the people who are claiming to be her family, she goes home with them as she begins the long road to recovery. As she struggles to remember, it seems like nobody is willing to provide answers. The real strength of this book is the author didn't paint herself into a corner. In my opinion, you really couldn't narrow down the list of suspects until the very tail end of the book which is what kept the story interesting. I can't say I absolutely liked everything about the second half of the story or the conclusion, but I also didn't hate it. I just personally thought the first half was more of a 5 star enjoyment level whereas the second was more at a 3 stars. Overall, a good read and I would love to check out the author's previous novel. Between the Lies by Michelle Adams is a psychological thriller in which the main character has lost all of her memory keeping her guessing just as much as the readers do. After a severe brain injury Chloe awakens not only not knowing those around her but even her own name eludes her. As she’s recovering Chloe’s parents have brought her home with them to take care of her. However Chloe only has more and more questions with each day going by when her parents refuse to give her much information on w Between the Lies by Michelle Adams is a psychological thriller in which the main character has lost all of her memory keeping her guessing just as much as the readers do. After a severe brain injury Chloe awakens not only not knowing those around her but even her own name eludes her. As she’s recovering Chloe’s parents have brought her home with them to take care of her. However Chloe only has more and more questions with each day going by when her parents refuse to give her much information on who she had been. As Chloe begins tod ig into herself she finds it seems no one is being truthful. One thing I will say right away is Michelle Adams definitely is a good writer and I did find myself enjoying this one for the most part. For me though with a story like this i always feel things slow down in the middle of the story when we begin to get lie after lie. What is the old saying….fool me once… so as much as I wanted answers to what was going on I got a repetitive feel while waiting for the answers. Special thanks to Michelle Adams & St.Martin's Griffin for providing me with a free copy of this book. Man! This book was good. Maybe I found this book so good because I've taken a break from reading Thrillers. Sometimes you need time away from a genre to rediscover your love for it. Chloe Daniels wakes up in a hospital with no memory of how she got there. She doesn't remember any of her family members. She has no sense of who she is. Her family seems nice and they claim to want to help her but she doesn't trust them for some reason. This was my first Michelle Adams novel and I must say I enjoyed way more than I thought. She had me on the edge of my seat and despite guessing some of the twist, I still needed to keep picking this book up. Some of the science seems a little suspect but that was the most important part of the story. 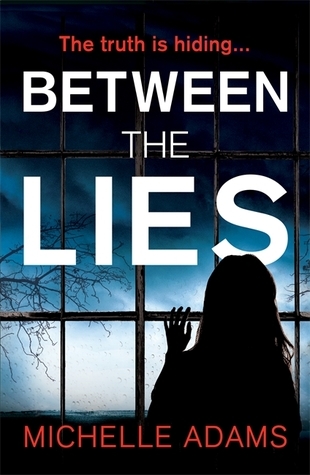 I received a free e-copy of Between The Lies by Michelle Adams from NetGalley for my honest review. Chloe wakes up in the hospital with no memory of who she is or how she got to the hospital. She is staying with her parents while she is recovering from her car accident. Her family seem to be lacking information and details that they are giving her. She feels like she is locked in at their property. She know that things aren't as they should be and that everyone is lying to her. Who can she trust I received a free e-copy of Between The Lies by Michelle Adams from NetGalley for my honest review. Chloe wakes up in the hospital with no memory of who she is or how she got to the hospital. She is staying with her parents while she is recovering from her car accident. Her family seem to be lacking information and details that they are giving her. She feels like she is locked in at their property. She know that things aren't as they should be and that everyone is lying to her. Who can she trust or is everyone lying? She slowly unravels the truth about her accident and everything else. Well... Between the Lies... hmm where do I start with this one? Chloe has amnesia and can't remember anything from her accident. She is struggling to understand her life and where she comes from. She is living with her parents and her sister trying to gain her memory back and get better. I started off with getting annoyed with her parents. Her father was super controlling right off the bat with "protecting" her from doing anything trying to gain her memory back. This to me was a sign right away Well... Between the Lies... hmm where do I start with this one? I started off with getting annoyed with her parents. Her father was super controlling right off the bat with "protecting" her from doing anything trying to gain her memory back. This to me was a sign right away to the author pointing clues to the reveal (which come on was annoying). The story was very predictable to me and a bit of a slow burn... which made it difficult for me to keep my attention focused on the story. Additionally, the ending did not live up to the hype to me and of course I figured out who was involved with her accident/trauma before the reveal. Overall, this wasn't really a memorable thriller to me and was a tad disappointed. 3 solid stars for me on this one. Thank you so much to St. Martin's Press and Netgalley for the arc in exchange for an honest review. This is my first book by Michelle Adams although she has written previous psychological thrillers including "My Sister" that was published in April 2017. Its target audience/readership is those who loved Liz Lawler's "Don't Wake Up" and Shari Lapena's "A Stranger in the House". I would say that this is a pretty accurate prediction. Chloe Daniels has lost her memory after a horrific accident. After spendinf time in a coma she is released from hospital into the care of her family who she doesn't re This is my first book by Michelle Adams although she has written previous psychological thrillers including "My Sister" that was published in April 2017. Its target audience/readership is those who loved Liz Lawler's "Don't Wake Up" and Shari Lapena's "A Stranger in the House". I would say that this is a pretty accurate prediction. Chloe Daniels has lost her memory after a horrific accident. After spendinf time in a coma she is released from hospital into the care of her family who she doesn't recognise at all. She doesn't even remember her own name. As she begins to recover she comes to believe that her family are hiding a secret from her and cannot be trusted. As some of her memories return she struggles to piece together what happened to her and realises that her family are lying to her about something. She vows to find out what secrets they are keeping and her determination to find out the truth could come at a cost and lead to devastating consequences. I enjoyed this one a lot, it has a great premise and although I predicted some of the twists pretty early on this didn't affect my overall experience. This is one of those books where you question whether any of the characters are telling the truth as many of them appear to have something to hide. All in all, this is a fast-paced, well written and gripping thriller from Adams. She is adept at writing a story that pulls you in whether you like it or not, making it very difficult to put down. I look forward to future books from this author. Highly recommended. Between the Lies is an adequate woman-in-peril thriller--Chloe has been in a car accident and is at her parents' home, recovering from her injuries. She also has no idea who she is, has no memory of her life before, doesn't recognize her family, and her father insists on treating her in the family home, saying it's the best way to help her recover. Oh, and the police want to question her about a hit and run she was involved in. One where someone she knew and loved died. And Chloe soon figured out Between the Lies is an adequate woman-in-peril thriller--Chloe has been in a car accident and is at her parents' home, recovering from her injuries. She also has no idea who she is, has no memory of her life before, doesn't recognize her family, and her father insists on treating her in the family home, saying it's the best way to help her recover. And Chloe soon figured out who died and wants to know how and why--and is she responsible? I liked Chloe a lot, and I loved the very creepy beginnings of Between the Lies where it seems like no one--not even Chloe herself--is trustworthy. How do you solve a crime that you might have committed? And what do you do when everyone you "know" is clearly lying to you? Those are great questions but Between the Lies settles into familiar territory--sure, your family might be lying, but even the Big Bad there is nothing compared to the ultimate Big Bad (who's pretty obvious once the story settles into its familiar groove) who is a delusional lying murderous...well, you know. While I found Between the Lies to be a pretty well written and standard thriller (hence the three stars--it's fine, it's not great, but it rolls along well enough) it could have been so much more! The book seemed to be headed in an extremely twisted direction for a while (I was thinking, "Is she going to go there? With her father? Whoa!" and also "Damn, a heroine who actually committed the crime she's afraid she did? Bring! It!") and I loved it! I felt like the author pulled back and made her father awful (but not as awful as he could have been) and made Chloe the victim of the crazed Big Bad--which was...okay, but those early signs that something very dark and (imo) daring was going on really sucked me in and having it turn into the traditional woman in peril thing was a letdown. Go big! Go dark! Also, Chloe's sister just was suddenly...not important, and her mother became a victim too and I would have liked some more agency for them. Ditto for Ben, who also started out interesting and then fizzled away. What would you do if you woke up and didn’t know who you were? Chloe Daniels had been in an accident she doesn't remember. Her parents and sister are there for her but it just doesn’t feel right. Something is terrible wrong. Something is missing. As she begins to slowly recover her family shares small bits and pieces of her life before the accident. But Chloe has the feeling they are hiding things from her. She is determined to uncover the truth but is afraid of what she might find. What if the people you should be able to trust the most are lying to you? The minute you start reading this book you know things are not quite right. There has been a horrible accident. The story is told from Chloe’s point of view and you feel as if you have just woken up from a coma along with her. Things are not what they seem. Her father is a psychiatrist and has a cutting-edge treatment plan for her amnesia, he is in total control of what Chloe should be told and what she is allow to do. It’s for her own good, of course. The story was interesting, but I felt it lacked emotion and was somewhat unrealistic. Chloe’s mother and sister’s behavior is very distant and stilted. How could they really let themselves and the situation be controlled by someone else, after all Chloe had almost died. My favorite part was Chloe’s determination to find the truth. I loved the fact that she pushes back on her family in an attempt to get at the truth of what happened to her. Once this happens the book takes off. BETWEEN THE LIES is an entertaining and quick read. Thanks to Netgalley, author Michelle Adams and St. Martin’s Griffin for an advance reading copy of this book in exchange for an honest review. Imagine waking up in the hospital and you have no idea how you got there, in fact you have no memory at all. Chloe Daniels finds herself in just that position. Michelle Adams has managed to keep the reader in as much of the dark as Chloe is. Unfolding the murky details makes for one suspenseful read. As Chloe’s memory slowly returns, we begin to sort out the truth about what really happened the night of the accident. Before the truth surfaces there are a lot of people involved and who really has Imagine waking up in the hospital and you have no idea how you got there, in fact you have no memory at all. Chloe Daniels finds herself in just that position. As Chloe’s memory slowly returns, we begin to sort out the truth about what really happened the night of the accident. Before the truth surfaces there are a lot of people involved and who really has Chloe’s best interest? How reliable is her memory as she tries to piece the details together? This is an enjoyable, twisty, and hard to put down read! Thank you NetGalley and the publisher for an advanced copy. Jaidee You said just enough to pique interest ! Nice ! Mary Beth *Traveling Sister* Fab review, Stacey! What would you do if you woke up one day and couldn’t remember a single detail from your past life? Not only that, the people taking care of you, who claim to be your family, you find out are actually keeping secrets from you about your past life and even outright lying to you, feeding you one lie after another after another? This is the exact situation that Chloe Daniels, the protagonist of Michelle Adams’s newest work Between the Lies , finds herself in after she wakes up following a horrific car accident. As she slowly recovers from the trauma, both physically and mentally, she starts to remember bits and pieces of her life, faded memories of events and people, as well as glimpses into the person she was before the accident. When getting closer and closer to the truth also means putting herself back in harm’s way, Chloe must decide whether it is a risk worth taking. Given the above premise, this book definitely started off quite strong. With the story being told mostly from Chloe’s point of view, the author did a good job keeping the suspense element going by putting us, as the readers, into Chloe’s mind and unravelling the truth of her life alongside her, pretty much every step of the way. The story continued to be intriguing as Chloe unraveled one lie after another and at several points in the story, initially at least, it was actually hard not to feel sorry for what she was going through, for the sheer helplessness of her situation. Unfortunately, around the midway point or so, the story started to drag a little and there were certain points where I kind of questioned Chloe’s actions in terms of how realistic it was for her to be doing what she was doing given the circumstances. The suspense piece also fizzled out a bit for me at that point, though it probably didn’t help that I had already figured out the ending early on and had already guessed who the “unnamed narrator” was whose thoughts were interspersed sporadically in between Chloe’s narration of events. Not sure if the story was too predictable or perhaps I’m just getting better at figuring these things out now after reading so many thrillers / suspense novels the past few years – I wasn’t surprised at the way everything played out and when “the truth” was finally revealed, it felt anti-climactic because I already expected it. With all the above said though, one of the things I appreciated most about this book was the writing. As the title implies, much of the book was about the protagonist trying to figure out the truth in between all the lies and the way the story was written, the lies actually blended in so naturally that, at times, it truly was hard to distinguish between the two. Also, the story was compelling enough to keep my attention throughout, despite some of the parts that dragged, which I feel is important in this case because I didn’t really like most of the characters all that much and couldn’t relate to any of them. Overall, this was a good story that is definitely worth a read, though don’t expect an “edge-of-your-seat” thriller because this definitely is not that type of book. I would categorize this more as domestic suspense, as there was no roller coaster ride of twists and turns and not much in terms of a “big reveal” (though of course, opinions may differ on this, as it depends on whether you figured out the ending early like I did). I would recommend checking this one out for yourself to see if it’s worth your time, as the story is certainly compelling enough to make this a relatively quick read. It took me a little while to get into this story. Once I did, it was a thrilling ride. Complex and twisty story. Intriguing characters, with everyone seemingly hiding something. Chloe is a bit of an unreliable n Chloe awakens in the hospital after a terrible car accident. Not only does she not remember the accident, but she doesn’t remember who she is or anything about her life and family. Her parents and sister attempt to help her remember her life, but Chloe feels they are also keeping secrets. Special thanks to NetGalley and St. Martin’s Press for a free, electronic ARC of this novel received in exchange for an honest review. Chloe Daniels wakes up in the hospital after an accident, with a head wound and no memory of what happened. In fact, she has no memory of anything. Returning to the care of her parents, she tries to patch together pieces of her past life with the help of her father, a psychiatrist with a speciality in hypnosis and memory recovery. Her parents and younger sis Special thanks to NetGalley and St. Martin’s Press for a free, electronic ARC of this novel received in exchange for an honest review. Chloe Daniels wakes up in the hospital after an accident, with a head wound and no memory of what happened. In fact, she has no memory of anything. Returning to the care of her parents, she tries to patch together pieces of her past life with the help of her father, a psychiatrist with a speciality in hypnosis and memory recovery. Her parents and younger sister, Jess, contribute to her memory recall by telling Chloe of the life she once had- the successful career as a lawyer and her beautiful seaside home, as well as details of the tragic car accident that took her memory. However, as Chloe’s memory start to return on their own, and they conflict with what she has been told by those closer to her, she begins to wonder if she should trust her own memories, or the people who supposedly matter the most to her? Right from the beginning of “Between the Lies”, by Michelle Adams, the story pulls you in. Immediately, as a reader, I began to make assumptions, about who could be responsible and which parts of the stories Chloe was being told, were true. Although there were parts of the story that were predictable, right from the beginning, I had to continue reading, as “Lies” very quickly developed into a story I could not put down. All of the characters in this story play an important role. There are no behind-the-scenes, appear-as-an-arbitrary-figure-in-the-background-and-then-it-is-revealed-he-was-the-main-suspect, kind of characters. This added to the story’s “whodunit” appeal, as each character could have been just as responsible as the next. As Chloe’s memory returns slowly, Adams allows you to experience the confusion, and the emotions associated with it. Although this is not a unique storyline, Adams’ talent is evident as the novel still manages to be entertaining and suspenseful. The ending is extremely satisfying, tying up loose ends and leaving no questions unanswered. For novels like this, I prefer this type of ending. The “guessing game” ending does not work in “whodunit” mystery novels, and I really appreciate Adams’ ability to tie up the plot in a neat bow. Adams has only one other novel, My Sister, and I will definitely be checking it out. For a relatively new author, Adams writes as if she’s been on the scene for years, and I am thoroughly interested in checking out her other works. Chloe Daniels wakes up in a hospital bed, confused she looks around to discover she has no idea how she got here and who these people are. In fact she doesn't even know her name. Following a horrific car accident Chloe struggles with extensive injuries, including a head injury that is causing her severe memory problems. This was absolutely terrifying right from the start as we watch Chloe struggle to place the people around her that are claiming to be family. She is forced to go home with them t Chloe Daniels wakes up in a hospital bed, confused she looks around to discover she has no idea how she got here and who these people are. In fact she doesn't even know her name. Following a horrific car accident Chloe struggles with extensive injuries, including a head injury that is causing her severe memory problems. This was absolutely terrifying right from the start as we watch Chloe struggle to place the people around her that are claiming to be family. She is forced to go home with them to a secluded gated home where she has no contact with anyone else other than them. Are they really who they say they are? Or is there more to this story? This gave me chills as I had trouble trusting Chloe's family members and their rather unorthodox approach to helping Chloe heal. I found myself constantly wondering if they were telling her the truth or spinning a reality they wanted her to believe. Why would anyone lie and what would be their motive? My gut feeling was there was something off with the dynamics of this family and it left me with a creepy uneasy feeling. I found myself getting more suspicious of everyone in Chloe's life. It was hard for me to decipher what was simply Chloe's altered mental status and what was reality. This led to a suspense filled ending that I did not see coming. This had me flipping the pages in search of Chloe's truth and what really happened the night of the accident. Chloe is a lost soul after she awakens from a head injury with complete memory loss. With only her unfamiliar troubled parents and younger sister to help piece together what happened one fateful rainy night, she doesn't know which way to turn or who to believe....BETWEEN THE LIES. Michelle Adams gives us a roller coaster of a read while Chloe slowly discovers tidbits of information about herself and the tragic accident (no spoiler here) that changed her life. BETWEEN THE LIES is a compelling read with shocking truths....and lies interspersed throughout the storyline. Anytime a book or a TV show resorts to a character contracting amnesia, it is automatically going to be hard to pull off as credible or interesting to me. It has been done and overdone. So from the beginning of this, I needed to be impressed with the rest of the story or the characterizations. If you like the amnesia tactic, you'll likely enjoy this much more than I did. The characters themselves were all a bit of a mystery, which can be intriguing. Here it is mainly because the main character an Anytime a book or a TV show resorts to a character contracting amnesia, it is automatically going to be hard to pull off as credible or interesting to me. It has been done and overdone. So from the beginning of this, I needed to be impressed with the rest of the story or the characterizations. If you like the amnesia tactic, you'll likely enjoy this much more than I did. A very riveting and suspenseful read! Chloe Daniels is involved in a car accident and wakes up in the hospital with no memory. Several weeks later she goes home with her parents and sister not remembering anything about her life. Dependent on her family to help her recall who she really is leads to many twists, turns and falsehoods. And let's not forget lies, lies and more lies. Riddled with unsettling moments this thrilling tale had me turning the pages to get to the truth. Author Michelle Adams d A very riveting and suspenseful read! Author Michelle Adams did a wonderful job of keeping me guessing throughout the whole story. Thank you to NetGalley and St. Martin's Press for an arc of this novel in exchange for my honest review. This was at times a little fantastical and you really did have to suspend disbelief for large chunks of it but, you know what? This was great fun and I was happy to go along for the ride. Chloe Daniels wakes up in hospital surrounded by strangers. But they aren’t strangers. They are her mother, her father and her sister. She has no memory of them. She has no memory or her name. She has no memory at all! After a near fatal car accident and serious brain bleed, Chloe is taken by her family to their This was at times a little fantastical and you really did have to suspend disbelief for large chunks of it but, you know what? This was great fun and I was happy to go along for the ride. After a near fatal car accident and serious brain bleed, Chloe is taken by her family to their home to recuperate. Her father a renowned physiatrist will try and help her regain her memory. She feels a stranger in her own home. Her family are very vague with details when she asks about the accident and her past life and she finds it hard to warm to them or even trust them. Her father feeds her medication as he continues his sessions with her and refuses to let her outside the house, saying she is not well enough and needs more time to recover. As she starts to slowly get some faint memories back she realizes that her family are not being truthful about the accident and her past. What are they trying to hide and why are they lying to her? This is told from Chloe’s perspective and this works really well as a tool for telling the mostly enjoyable story. Everything about her family home, from the house itself to her family is a little bit creepy. We struggle to figure out with her if things are really a little bit sinister or is her paranoia creating a false past. This zipped along nicely and was one of those ones where I had to read “one more chapter”. The ending I found a little weak but that didn’t take away from my overall enjoyment of the book. While not really in any way original it was still a very enjoyable read overall. Intriguing psychological thriller about a woman who has lost her memory after a horrific accident and comes to believe her family are lying to her and not who they seem. Full and proper review for the blog tour. Michelle Adam’s is fast becoming one of my favourite authors for her fabulous descriptions of dysfunctional families. I’ve always been fascinated with books about memory loss and what it’s possible for the brain to forget, so this book really appealled to me. This book gripped me from the start as it soon became obvious that something wasn’t right. The house that Chloe finds herself in seems very impersonal and neglected which struck me as odd for a supposed family home. The isolated location Michelle Adam’s is fast becoming one of my favourite authors for her fabulous descriptions of dysfunctional families. I’ve always been fascinated with books about memory loss and what it’s possible for the brain to forget, so this book really appealled to me. This book gripped me from the start as it soon became obvious that something wasn’t right. The house that Chloe finds herself in seems very impersonal and neglected which struck me as odd for a supposed family home. The isolated location for the house and her family’s insistence that she stay inside sent a shiver down my spine as I started to wonder what was going on. Chloe was my favourite character especially as the story progresses and we learn more and more about her. He fear and confusion was almost palpable at times as she tried to unravel the mystery of what actually happened. Her emotions and guilt about the accident was very emotional and I definitely felt myself tearing up at times reading about it. I admire her determination to discover what really happened despite lots of opposition not least the fact that she couldn’t remember much. This was a fast paced, gripping read that I really enjoyed reading. The author cleverly let’s the story and secrets unravel making this a very intiguing read that is hard to put down. The chapters are fairly short making it a fairly easy read though I found I flew through the chapters promising myself just one more then I’ll sleep. This is Michelle Adam’s second book and I really look forward to reading more from her in the future. If you like unsettling, brilliantly paced and gripping books you’ll love this! 5/5 stars. I absolutely loved this book, and found it to be a riveting and atmospheric read, filled with doubt and paranoia. I’m very curious to see what the author will write in the future! Between The Lies by Michelle Adams was a book that I struggled to put down. I started it on Saturday afternoon and finished it Saturday night. The story had me so engrossed that I really just had to keep reading. I love it when a book takes over like that. This was my first book by this author and I will definitely be looking out for her again in the future. This was a very fast paced story of love, family and trust. Chloe Daniels wakes from a coma after a car accident that nearly took her life n Between The Lies by Michelle Adams was a book that I struggled to put down. I started it on Saturday afternoon and finished it Saturday night. The story had me so engrossed that I really just had to keep reading. I love it when a book takes over like that. This was my first book by this author and I will definitely be looking out for her again in the future. This was a very fast paced story of love, family and trust. Chloe Daniels wakes from a coma after a car accident that nearly took her life not knowing who she is. The people by her bedside say they are her family but she can't even remember them. They are trying to protect and help her but she feels frustrated at not being able to remember anything about her life. Slowly the memories start to return but she struggles to put the pieces together. She is having vivid dreams but are they just dreams? Her family seem to be keeping important information from her and she is no longer sure if she can trust them. Does she really want to know the truth? Books where the main character has lost his/her memory are always intriguing, especially when it becomes clear that the poor victim, with waking up, only sits at the start of the ordeal, not the end. Chloe wakes up in her childhood home, surrounded by her parents and sister, but it is immediately obvious to the reader that her familiy is part of the problem, not the solution. As thrillers go, not all people who are offering to help Chloe have her best interests at heart. Chloe becomes more and mo Books where the main character has lost his/her memory are always intriguing, especially when it becomes clear that the poor victim, with waking up, only sits at the start of the ordeal, not the end. Chloe becomes more and more determined to find the whole truth about the horrible accident that left her with more than just some physical wounds. Lots more. Does this make Chloe a likeable person, someone the reader can identify with? In my opinion, not wholly. In times she is not making sense at all and I still have some questions with the decisions she has made - and will make. A nice enough read but not exceptional. I was born in 1981, the youngest of five and the only girl. For a short period of time after that I might have been my mum's long awaited princess, but it became obvious that I was the kind of child who was more into mud pies and catching insects than I was pretty dresses. I loved my purple Doc Marten's, hated my floral wallpaper, and was never allowed to paint my bedroom black. No, not even the c I was born in 1981, the youngest of five and the only girl. For a short period of time after that I might have been my mum's long awaited princess, but it became obvious that I was the kind of child who was more into mud pies and catching insects than I was pretty dresses. I loved my purple Doc Marten's, hated my floral wallpaper, and was never allowed to paint my bedroom black. No, not even the ceiling.